Zombiepalooza Giveaway & My Cat Can Beat Up Your Zombie! Edie Ramer, author of the paranormal romance Cattitude, answers the age old question about who would win in a fight – cat or zombie? I love my cat so much I wrote a book about her. She’s a sweetheart with me, but she’s got another side. She’s a great hunter and when she spies a mouse, you can bet that mouse won’t be living for long. She killed one already last week. I saw her playing with a mouse as I was typing, the mouse flying in the air, then it would fall to the carpet, and then she would send it flying again. I thought it was her toy and remember thinking she hadn’t played with it for a while and that the squeak wasn’t working. It was only later that day, when I spotted it on its side in the hallway, that I realized it was real and it was dead. While I’d been revising my ms. (fittingly titled Dead People) and answering emails, she’d been three feet away from me, killing the mouse. That wasn’t the first mouse she’s killed. A couple of times she’s played with a mice in our family room while our English setter watched from her comfy seat on the couch, as though the cat was doing it for her entertainment. I’ve never seen zombies in real life, of course. Because they don’t exist. But in the movies, I’ve seen dogs attack them, and end up running from them. If zombies did exist (but they don’t, right? ), then I can see why some dogs would run from them. Or like mine, stay on the comfy couch. But what isn’t shown in the movies are cats running away. 1. You try to direct a dozen or more cats and see how well they listen to you. 2. Cats are one hundred times faster than zombies. One hundred times meaner, too. I can easily see an army of feral cats taking down the zombies. Body parts strewn on sandy lawns, arms caught on cactus spines, heads rolling down the streets. Kids would use them as soccer balls. So, don’t use a bat to kill a zombie, use a cat. And they’re good for mice, too. In fact, I think animal shelters could use a new slogan: Adopt a cat; kill a zombie. Who do you think would come out on top? Dogs, cats or zombies? It’s all in the Cattitude . . .
After Belle the cat switches bodies with a psychic on the run from a murderer, she wants her perfect cat body back instead of this furless human one. But she doesn’t count on falling in love with her former owner. Or that a CEO and a beauty queen want to use up her nine lives. Now is her chance to prove anything a human can do, a cat can do better. 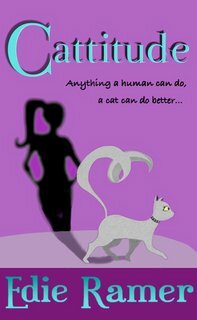 “Cattitude is a magical tale that you won’t soon forget. Edie Ramer has a writing voice that charms, and she pulls the reader right into Belle’s amazing world.” –Cynthia Eden, author of Deadly Fear, I’ll be Slaying You, and Eternal Hunter. 1. To enter to win, comment on this blog, leaving an email address to contact you in case you win. 2. The giveaway runs from now until October 28th at midnight. On October 29th, TWO winners will be chosen by random.org and contacted. They have 72 hours to reply before the prize defaults to the runner-up. 4. International!! Anyone from anywhere can enter this giveaway! The battle has begun, and the cats are winning! Christina, my beagle and English setter would run, but the beagle would take an arm or another limb to chew on. She eats anything. Cats would totally be able to take down a zombie. Dogs would just run. Brandy, it’s true that will eat mice — usually after they tire of playing with the dead body. I’m sure they’d do the same thing with zombies. And then they’d puke it up later. I can see the cats trying to eat the zombies because they are sooo slow…. Miriam, I hate taking my cat to the vet. She complains loudly during the entire drive there and back. Janie, I’m sure Chuck and Joey is tough enough to live up to both those names!